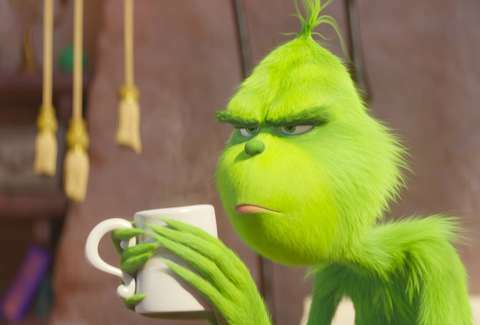 Continuing the bizarre trend of featuring original tracks by the hottest rappers in the land in their movies made for very young children, Illumination -- the same studio that brought us four movies about the Minions, and counting -- has an upcoming Dr. Seuss adaptation of The Grinch that contains a song by Tyler, the Creator. You know, that musical artist who's really popular with the elementary school demographic and absolutely did not begin his career in a group called Odd Future Wolf Gang Kill Them All. This version of "You're a Mean One, Mr. Grinch" has some of the flavor of Thurl Ravenscroft's original from the 1966 animated television special, chopping and screwing the lyrics and adding in a snappy bass line for Benedict Cumberbatch's vision of the Grinch. It is utterly unlike any other song I have ever heard, which is not necessarily a compliment nor a criticism. It's actually remarkable how difficult it is to describe when I've only had a chance to listen to the song -- all one minute and 48 seconds of it -- 20 times. Maybe the reason this "Mr. Grinch" seeps into the uncanny valley is because it sounds like how songs sound when they're sung by someone who has maybe heard them a bunch of times before, but has only retained about half of the lyrics in their memory and flubs the way through the other bits. Like when you think you're about to flex at karaoke but forget that "Someone Like You" has that weird part near the end that no one knows. We'll start with what it is: Tyler, the Creator hums and raps a few of the more memorable lines from the original song -- "You've got termites in your smile," "I wouldn't touch you with a thirty-nine-and-a-half-foot pooooole" -- while a chorus of what could be children, as well as an adult woman, sing along in the background. But then, instead of following the insult comedy listicle trajectory of Ravenscroft's ballad, the new song adds in a bunch of other stuff about Halloween and not playing around: "What you so mad for? Halloween coming 'round and we ain't knockin' on your door, man." There are seems to be an obsession with "bad bananas," which we can only conclude is a sneaky tie-in to the Minionsverse. Maybe the concept of "arsenic sauce" is a little PG-13 for the tender youth of today. Honestly, the big band instrumentals aren't too bad in this track. Who among us hasn't tapped our foot to a questionable tune just because the beat is pretty good? It's when the lyrics come in that it becomes a little iffy. Is this how I'm going to feel about this Grinch remake we don't need? Am I going to like this movie??? Max the dog is very cute in the trailer. Maybe I need to stop being so vexed and bitter about it all. Isn't there a word for a person like that? I'm sure it'll come to me.